« How important is soil temperature? Love your blogs about your experiences. They are always so thorough. This one was especially helpful, as I always thinking about how to compost better (on a slope and in the shade, the only space I have) and got some ideas about bin building. I look forward to hearing you in Asheville this weekend. Dorothy, I’m on the schedule 3 times in Asheville. On Saturday, I’ll be talking about cover crops and Sunday I’ll be talking about the information in each of my books. I’m looking forward to being there and connecting with everyone again. I am sorry I’ve missed you in Asheville, again. However, this leads in to asking you how you first created those permanent beds. Judi, I thought about you, expecting you to show up at some point. I double dug my beds, starting with a few and going from there. It took a few years before the garden got as big as it is. As I had more ideas, time, and energy, I added more beds. Great article. Really nudged me to rethink my setup. Mark, rethinking is good. It keeps us on our toes and makes room for new ideas. Not that all the old ideas are bad, but sometimes they can use a little tweaking. 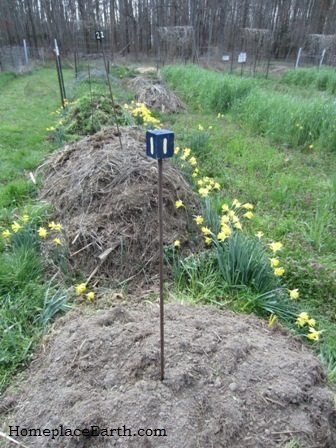 I loved reading about your compost piles in your book and started one in one of my garden beds last gardening season. A couple days ago I rotated the pile down the garden and it is already looking well on its way to becoming beautiful compost, and its in the garden where I need it! No more wheelbarrowing compost into the garden!The soil where the pile was last season and winter is beautiful and should grow great squash or maybe cukes. Thanks for giving such a great, and simple, idea for composting! Thanks for letting me know about your compost pile IN your garden. It works so well for me and I’m glad others are trying it. Hi, I am in zone 5a, I never could figure when is right to plat my winter cover crops as things are still being harvested in sep, cold comes fast the rye seed never seem to sprout!! Any suggestion? It is best to have rye planted by the time of the last frost, if not before, although I have planted it a bit past the last frost. If you have cold weather crops in the ground past the last frost, you might have to go with mulching that ground with leaves for the winter. You might choose varieties of your summer crops that mature in a shorter time. In Virginia we have a longer growing season and would be planting different varieties than you would in the northeast. The seed companies up there will have some good suggestions. What kind of sickle do you use? Serrated or smooth? Smooth. There is a photo of it in Grow a Sustainable Diet and in my post about tools–https://homeplaceearth.wordpress.com/2011/12/13/tools-i-use/. As in all my blog posts, you can click on each photo and it will open in a new window for a closer look. Ok, I will look in the book. Great book, by the way. I can hear you talking when I read it. I don’t want to say this too loudly, but I have actually been using Grow a Sustainable Diet and Pam Dawling’s Sustainable Market Farming more than Rodale’s Encyclopedia! Sometimes when I would read the papers my students turned in I could hear their voices in my head. It was like they were reading it to me, which makes for a pretty neat experience. Maybe it is about time for new reference books and more folks will come to rely on the books Pam and I wrote. I have used Pam’s book as a reference and daughter Betsy, who teaches the college classes now, refers to Sustainable Market Farming, in addition to my work. These are the things gardeners learn over the seasons. I think it come down to convenience and accident. Many of the things I was taught as a young gardener just doesn’t make sense anymore. When my fellow gardeners learn that I no longer till my garden, they think I have lost my mind. I like your blog. Thanks for the information. I’m happy you are enjoying my blog. I believe we need to always rethink what we are doing. Even rereading the books we think we know will reveal new insights and inspiration. Also, we might question what we were thinking when we followed certain paths, as we reexamine them in light of what we know now. Life is a journey with lots of paths to explore. I can’t believe I have not found your blog until today. Such a huge amount of information. Thanks! This is the first winter we have planted cover crops in our garden. 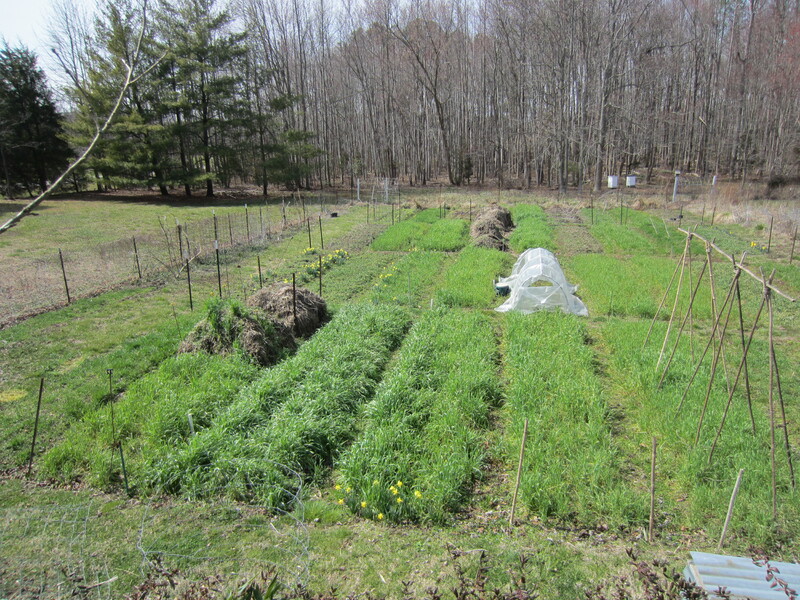 I planted rye and Barley in October in both raised beds and in ground. Since it was such a long warm Fall ( we are in Madison VA) they grew and grew to amazing lengths and didn’t really get frosted until late November. What should I do with these beds come Spring when I want to plant. Do I pull and compost, or cut and compost or cut and plant among the roots? I haven’t found a satisfactory answer in any other sources. I cant wait to finally get subscribed to your blog. Bonny, keep reading the blog and you will probably find the answers to your questions, especially in the post https://homeplaceearth.wordpress.com/2011/05/17/cutting-a-rye-cover-crop-at-pollen-shed/. 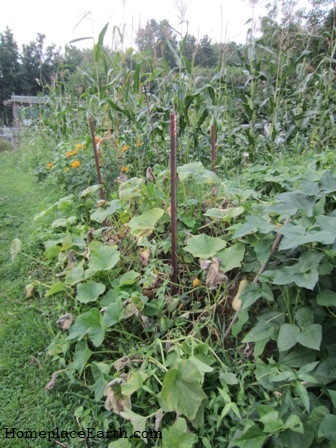 In my book Grow a Sustainable Diet I have sample garden plans and further explain how to use cover crops. Thanks Cindy That was just what I needed! !